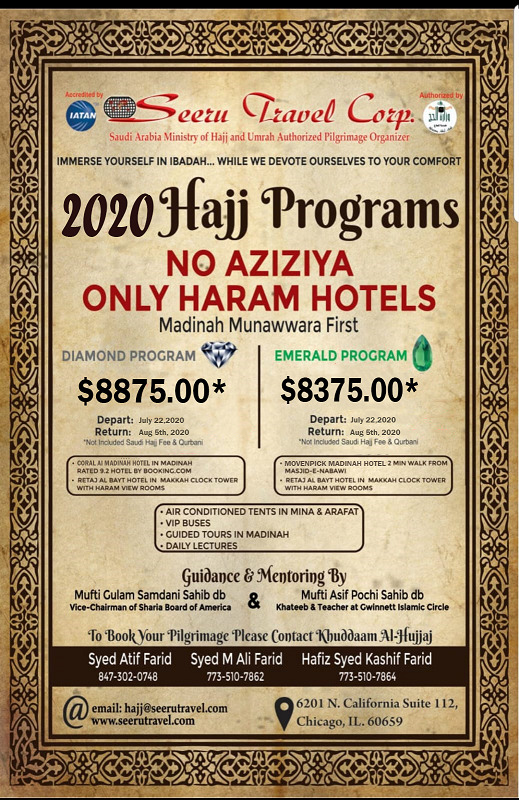 Emerald Program | Seeru Travel Corp.
Side Trip Before or After Hajj available. Zowar International Hotel Next to Gate # 14 of Masjid Nabawi. Ground transportation:Madinah/Jeddah in VIP coaches. Transportation to and from Manasik. Mufti Ghulam Samdani Sahib will accompany the group. Mufti Asif Pochi sahib will accompany the group. Conducted tour of holy and historic sites in Madinah Munawwara by professional guide. 24 hour personal assistance by Khuddam Al Hujjaj accompanying the group.